CB London Gazette 7 May 1897. CMG London Gazette 9 November 1905. CBE London Gazette 3 June 1918. John Sanctuary Nicholson was born in Kensington, London, on 19 May 1863, second son of W. Nicholson, of Basing Park, Alton, Hampshire. He was educated at Harrow, was commissioned from Sandhurst as Lieutenant in the 7th Hussars on 6 February 1884, and was promoted to Captain on 23 January 1891. He spent eight years in India with his regiment before being sent to Rhodesia, on special service, in the aftermath of the Jameson Raid into the Transvaal, and was deputed to take over the ordnance and ammunition of the British South Africa Company's police in Bulawayo from Lieutenant-Colonel Plumer. As a result of the Jameson Raid the colony was practically denuded of European police and the British South Africa Police were now divided into two divisions, Mashonaland and Matabeleland, with headquarters at Salisbury and Bulawayo respectively. Nicholson was appointed the first commander of the Matabeleland Division of police and at the outbreak of the Matabeleland Rebellion in 1896, he was the only Imperial Army officer on the spot. During these operations Nicholson played a distinguished part and the B.S.A. Police established itself incontestably as Rhodesia’s first line of defence. He was Mentioned in Despatches (London Gazette 9 March 1897), received the Medal, and was created a Companion of the Distinguished Service Order. Nicholson is mentioned throughout Lieutenant-Colonel Herbert Plumer’s excellent narrative of the campaign An Irregular Corps in Matabeleland. Nicholson was Commandant-General of the British South Africa Police from November 1898 to October 1900. He became Major on 27 May 1899, and served in the South African War, 1899-1902, first in command of the B.S.A. Police and a Brigade of Bushmen, and afterwards in command of the 1st Brigade, Rhodesia Field Force. He was mentioned in despatches (London Gazette 16 April 1901); was given the Brevet of Lieutenant-Colonel 29 November 1900; received the Queen’s Medal with four clasps and the King’s Medal with two clasps, and was created a Companion of the Bath. He was Inspector-General of Volunteers in Rhodesia from 1898 and was employed with the South African Constabulary from 23 October 1902, until 8 July 1903, when he succeeded Baden-Powell as Inspector-General of the South African Constabulary, a position he held until 20 August 1905, when he retired and was rewarded with the C.M.G. 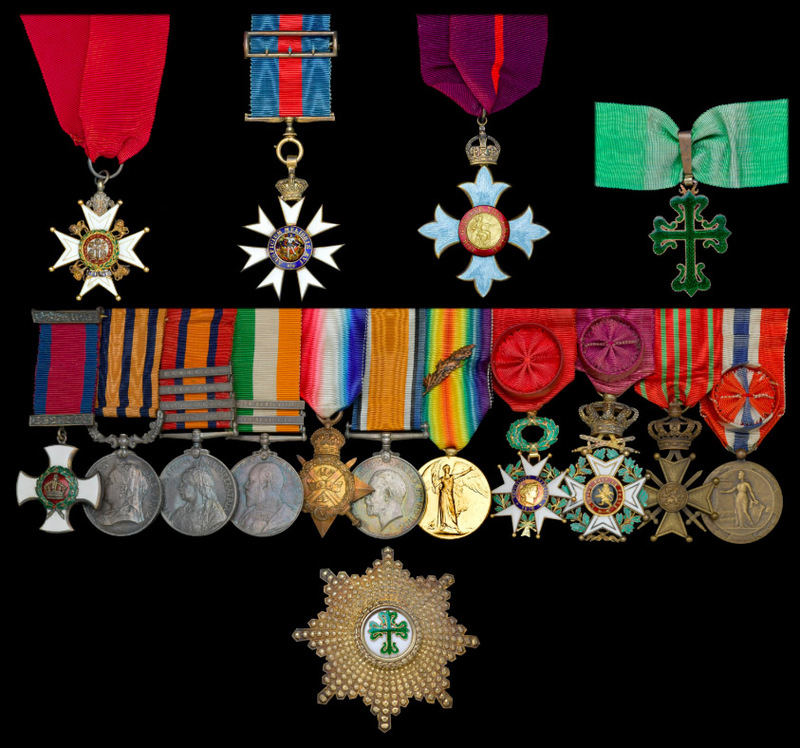 He became Lieutenant-Colonel on 8 July 1903, and Colonel on 23 February 1907. During the First World War Colonel Nicholson held a special appointment as O.C. Reinforcements at St Nazaire from 15 September 1914 to 23 April 1915, when he became Base Commandant at Havre. He was temporary Brigadier-General and Base Commandant, British Armies in France, 2 December 1916 to 31 December 1918. For his work during the war he was created a C.B.E. in the 1918 King’s Birthday Honours’ List. Nicholson retired from the Army in 1920 and in the following year was elected the Conservative Member for the Westminster Abbey constituency in a by-election following the death of the incumbent M.P., being re-elected in the following two general elections of 1922 and 1923. Nicholson was never married and resided both at Bordean House, Langrish, Petersfield, and at South Audley Street, Mayfair. He was Vice-Chairman of the Hampshire Territorial Force Association, and died on 21 February 1924, of pneumonia at his house at South Audley Street. Sold with a French Government presentation medal ‘Offert au nom du Departement par le Prefet de la Seine Infe’, dated ‘1914-1918’, hallmarked gold, 33mm, in fitted Arthus Bertrand case, the lid with gold embossed dedication ‘Au Brigadier-Général Nicholson Commandant La Base Britannique au Havre’; and a Belgian silver medal by G. Devreese, 75mm, dedicated to Brand Whitlock, American Minister in Brussels, ‘A son Excellence Brand Whitlock La Belgique Reconnaissante 1914-1915’.